What would you do if you were finishing up your last year in collage and got the call that you were needed for duty in Iraq? 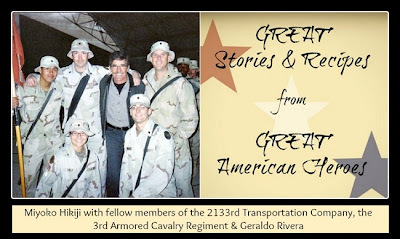 I got the chance to Co-Host a wonderful series of stories and giveaways called the Great Stories and Recipes from Great American Heroes series from the blog The Saturday Evening Pot where Anne is sharing stories and recipes from a few of our special war heroes. Today's episode features an amazing woman named Miyoko Hikiji. Each person on this earth has a story to tell, you never truly know a person until you've heard some of their stories and start to feel the emotions that have molded them into the person they are today. Miyoko served active duty twice. Once in the Army from 1995-1998 and again in the Iowa Army National Guard from 1998-2004. Her Army resume is not a small one! Miyoko Hikiji served as a Unit Supply Sergeant and Armorer, a Specialist, an Administrative Sergeant, a Truck Driver as well as a Unit Correspondent! She has been a busy woman and worked hard at all she did. One of the questions that Anne has asked all of her guest during the Great American Heroes Series is "Have you had a defining moment during your service in the US Military?" "The first defining moment I remember was when I reached my first permanent duty station, Fort Polk, Louisiana, assigned to the 1st Bn, 2d ADA. It was the start of the fiscal year sp even though I'd just passed the Army Physical Fitness Test and the other training tasks in basic training, the entire unit was going through annual testing. One of the tasks was a 20K Road March with a 50lb ruck, weapon, gear, helmet... the full "battle rattle". It started at 4am, in the woods, in the darkness. I had a strip map that I was barely read by chemlight. I shuffled along at the tail end of the 100 soldier unit and by the second hour - Several soldiers had fallen out and had been taken back to the unit or the TMC bu ambulance from either heat exhaustion of some other injury! My feet has developed big bloody blisters and my body wanted to STOP... but my mind didn't want to quit... I'd come too far to fail now. I needed to know what I was made of so I pressed on and finished just within the 4 hour limit!! After that, I never really doubted that I tough enough for the job." After reading the story above, you can tell that Miyoko is a determined woman and wasn't going to let anything get in the way of her goals! The second story that was shared by Miyoko Hikiji, is from near the end of her enlistment contract and is just as empowering as the first! And since I was born and raised in North Carolina and still live there today... the story behind Miyoko's recipe is really interesting to me! When Miyoko first arrived to her Stateside duty station in Fork Polk, she realized that her roommate was a cook from NC. Having a cook as a roommate, Miyoko's bunk had a few cooking devices which made it easier to chow down with friends and not be saluting officer after officer. Their room became a hang out and the girls ended up serving up enough food for some of the men in their barracks! They would literately line up at the door! One of recipes that Miyoko remembers serving up was called Spaghetti with Red Sauce. The recipe was created to feed around 100 soldiers and has been reduced to serve 25 for the Great Stories and Recipes from Great American Heroes series. To give you an idea of Miyoko's recipe, I have listed the ingredients below. The full recipe can be found at The Saturday Evening Pot. To view the cooking directions, visit The Saturday Evening Pot. Today, Miyoko is now an Author, as well as an Actress and Model. She has done commercials, industrial film work, infomercials and so much more! She's truly an amazing woman! Enter to Win an Autographed Copy of "All I Could Be"
Disclaimer: In accordance with FTC guidelines - NO PURCHASE NECESSARY to enter The participating bloggers were not compensated for this post. Void where prohibited by law.